In April 2017, I traveled to Japan to do some backpacking and general exploring of the country. I spent 9 days walking on a section of the Tokai Nature Trail, beginning in Kawaguchiko, Yamanashi Prefecture, on the northern side of Mount Fuji and ending in the Kurata region of Shizuoka Prefecture, about 125 trail miles away. During that trip, I came across a section of the Shinkansen where the train was leaving one tunnel, traveling a short section of track at full speed, and entering another tunnel. The fence surrounding the tracks was fairly close to them, and given the frequency with which the Shinkansen runs, I knew I wouldn’t have to wait long for a train (or many, as was the case) to go speeding past. I have a friend who is super into trains. Like has spent good money on rare mileage excursion trains into trains. So I knew he would love seeing the Shinkansen up close. I checked the time and it was a reasonable time for him being on the west coast of the US, so I texted him and asked if he could do a video call. Sure! Then I stuck my phone in the fence and waited for a train to go by. It was awesome. What was even more awesome is not only was I in a relatively remote part of Japan, but he was on the BART in the Transbay Tube (i.e. 100+ feet below the San Francisco Bay). And he was able to see everything just fine! It was awesome. He was happy. I was happy. It was a fantastic day. So, given that that’s a thing I can do, and do pretty trivially, what’s the point of using a radiogram to send a maximum 25 word message from one person to another? Why does the NTS exist? What purpose does it serve? Why would someone want to bother? We have email, texting, international intercontinental real time high definition video calls. Why a radiogram? One of the functions amateur radio can serve is to provide communications when all other communications are lost. Natural disasters can take out power to huge areas, which can impact phone and internet services. They can destroy towers or break overhead communications cables. I’m a member of Portland NET, which is Portland’s version of CERT. As a ham radio operator, my primary responsibility is providing communications support between folks on the ground and folks at the command center. In NET, we use a “form 8” which is similar to an ICS form 213 general message form. It’s designed to be able to be filled out and passed on by anyone, even without any formal training. When relaying it over the air, you read the field names as well as the contents, so the order in which you read things isn’t important, and there aren’t technical things like checksums or callsigns or anything, it’s just a simple from/to/message sort of deal. Easy. NTS radiograms are a bit more complex than that. There are callsigns. Checksums. Limits on the number of words. Precedence. But they still have a lot in common with ICS213 and NET form 8. They have a sender and a recipient. And they have a message. And most importantly, it’s important that they are relayed without error from one person to the next until they end up in the hands of the designated recipient. In a disaster scenario where NET gets deployed, even if there are other means of communication active, our role will still be in large part communications. Even if cell service is active, we may still be handling a lot of written traffic. And we need to be able to effectively and accurately convey those messages. However, we don’t often get an opportunity to practice these things or put them to work. Sure, we can come up with exercises and practice and such, but contrived examples are hard, and unless it’s interesting or useful, attendance is likely going to be fairly poor. But NTS provides a way in which practice can be had! Practice writing down what someone is saying over the air. Dealing with things like less-than-perfect signals. The sending person talking too fast and you need fills. The receiving person not writing fast enough and they need fills. General radio issues that might crop up. All of this is valuable practice, and the more comfortable you are doing all of these things, the better you’ll be able to fulfill your role in the event of an actual emergency, which could ultimately mean lives saved. Originating traffic, even if it’s just “DID YOU SEE THAT LUDICROUS DISPLAY LAST NIGHT X 73”, gives everyone who handles that piece of traffic an opportunity to practice and hone their skills. Also, active nets are nets people come back to. If a traffic net opens and there’s no traffic but 25 people checked in, what’s the point? But if there’s a bunch of traffic, then at least it gives people a reason to keep checking in! And if there’s “actual, important traffic” being passed, it’ll probably be pretty obvious, and if not, well, that’s where message precedence comes in. The NTS as a whole is also a good muscle overall to exercise. The idea with it is that using only radio waves and some pen and paper, a message can be efficiently and accurately communicated from anywhere in the country to anywhere in the country. Working the system means weaknesses can be exposed, flaws fixed, improvements made, etc. Working the system gives it purpose, and gives the people who are part of it a reason to be there. I would love to send you a radiogram, or receive one from you! You know where to find my info! I’ve been listening in on and checking into the NTTN (Northwest Oregon Traffic and Training Net) net for quite some time. Just recently, I sent my first radiogram! I’m a net control operator for the NET net here in Portland, and decided that I’d talk about NTS and traffic handling during one of my sessions. NET doesn’t use NTS radiograms, but I still think there’s a lot of valuable experience to be gained from participating in NTS that will directly apply to NET deployments. I’d been listening for a long time, but was nervous about volunteering to handle traffic, and nervous about trying to originate my own traffic. What do I do with traffic I’ve handled? How does it get from me to the person who it’s destined for, assuming it’s traffic bound for a local person and I’d be taking it the “last mile” to the person. As far as originating traffic, what sort of traffic is appropriate? NTS is “formal” traffic handling, but does that mean it can only be used for formal messages or can I say hi to a friend across the country for grins? I asked Michael AE7XP what his thoughts on the matter were, and he suggested I ask the net control of the NTTN some night, that it could be an interesting discussion and they’d have better answers for me anyways. So, this Friday, I did just that. If I handle a piece of traffic, what do I do with it? How do I get it that last mile to the recipient? What sort of traffic is appropriate to bring to the net? Can I say hi to a friend or is that too informal? And I got answers! It wasn’t the lively discussion Michael was suggesting it might be, but I at least became much more comfortable with the idea of participating in the net in a larger capacity than just checking in every now and then. For last mile handling, generally it’s a phone call. I found a good script for this here. If you have the email address of the recipient, an email works. Or sometimes they are sent as postcards. I remember getting my “Greetings from amateur radio” postcard back in the day when I first got my license. Now, the irony of using email or a postcard for last mile delivery of a radiogram is not at all lost on me. If you send someone an email, chances are good there will be a fairly significant amount of internet traffic generated to originate, process, deliver, and store the email, much of which will cross the country if not the world, involving many round trips of TCP packets and whatnot. I mean, in a world where I can stand next to some train tracks in Japan out in the countryside and make a video call to a friend who is currently on a train in a tunnel at the bottom of the San Francisco Bay so he can watch a train go blowing past me at 300kph, in real time, what’s the point of NTS anyways? But I digress (and I’ll address some of that during the net, and probably a post here in the future). As far as originating traffic is concerned, it seemed like pretty much anything was fair game. Obviously it has to be compliant with FCC part 97 etc etc, and don’t use it for passing information about the death of a person or other very private sort of thing, but say hi to a friend across the country? Sure! That’s why there’s a precedence in the radiogram anyways! Plus, it’s all practice, and practice is good (and is one of the reasons NTS is still valuable). So after I asked my questions and got my answers, I said “in that case, KT7CAT with traffic” (my call sign changed to K1CHN the following day). Net control called out for volunteers, KC7ZZB took on the challenge, and I relayed to him my number one, a short greeting and well wishes to WR0U, the first ham I ever met, who lived 2 houses away from me during my high school years. Given the call sign change, it’s a crapshoot whether or not his reply (if he replies) will come back to me, but we’ll see! I also got some compliments on “that was a good number one” etc. I think because I read things out slowly enough, had the protocol down, etc. Or maybe just general words of encouragement, who knows! Felt good, anyways! As part of this process of exploring this aspect of amateur radio, I came across a site where one can manage their radiograms, ones they’ve originated, handled, or been the recipient of, and not only has the prospect of putting it to use gotten me more interested in traffic handling as a whole, it has inspired me to work on a web application of my own for some ham radio things. The site, I just call it “radiograms” by N2SHO, is pretty cool. 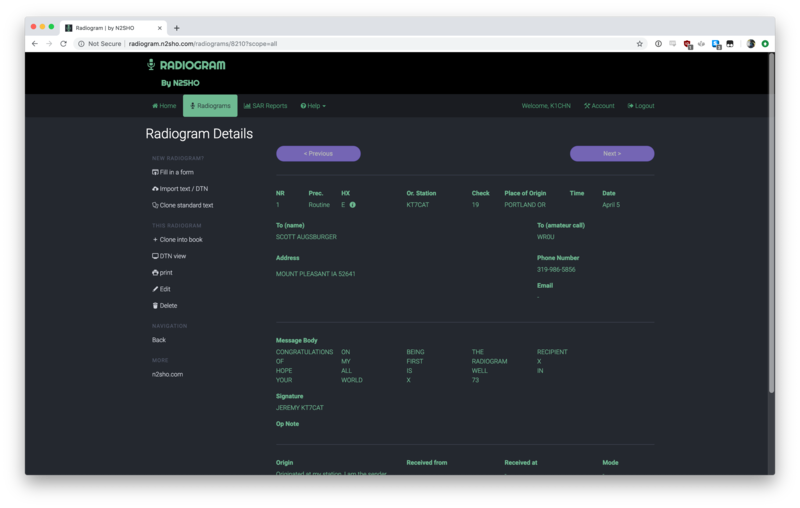 I’ve been using it to practice copying traffic that other people are handling, including book traffic (though it could use a slightly different flow for book traffic than it has, methinks), and I used it to compose and now track my #1 radiogram, and hopefully more in the future! All in all it was a good time, and I’m glad I finally spoke up and asked my questions that had been burning in the back of my mind for so long. This was my first radiogram, but I hope it won’t be my last. Tomorrow before the NET net, I hope to handle some traffic myself, if for no other reason than so I can talk more about it during the net afterward! Should be interesting, if nothing else!